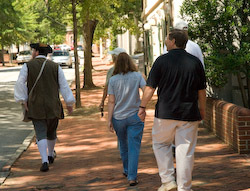 Come join our colonial-clad host on a stroll around town and awaken the rich history of 18th-century Annapolis. Did you know that for nine months in 1783-84, Annapolis served as the capital of the United States? 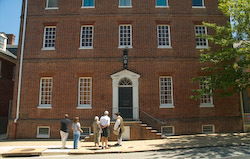 There is much to see and learn in Annapolis so come explore the city with us! Hammond-Harwood House - This five-part mansion is a National Historic Landmark designed by architect William Buckland for legislator Matthias Hammond. Thomas Jefferson believed the doorway of this house to be the most beautiful doorway in colonial America. Chase-Lloyd House - This Georgian style home was begun by Samuel Chase, a Maryland signer of the Declaration of Independence, and completed by Edward Lloyd IV. It is the site of the marriage of Mary Tayloe and Francis Scott Key. Paca House - A five-part mansion built by William Paca, Maryland governor & Declaration of Independence signer. You will learn about the interesting history of the house, and when it is not occupied, visit the 1.8 acre pleasure garden behind the house. Brice House - This impressive five-part Georgian style mansion was built by James Brice, an aide-de-camp of George Washington during the American Revolution. This is the first of several houses seen on the tour that were built in town specifically for entertainment, hence the name “town house”. Ogle House - Home to two Maryland governors and a documented host of a distinguished dinner for George Washington. Government House - Home to Maryland's governors and the site of much political entertainment. St. John’s College – One of Annapolis’ two colleges with about 500 undergraduate/graduate students attending. It was originally founded as King William’s School in 1696. Saint Anne's Church - This beautiful church is built in the Romanesque Revival style and was the only church in colonial Annapolis for worshippers to attend, excepting the private chapel in the house of Charles Carroll of Carrollton for Catholic worshippers. The burial grounds date from 1695 to 1790, and there are several notable stained glass windows, including one by Tiffany Studios. Colonial Kitchen - This tour includes a visit inside the colonial kitchen of the Hammond-Harwood House. The kitchen, in a five-part mansion, would have been the center of activity for servants and slaves when preparing for one of the many social evenings put on by the gentry living in this grand house. Maryland's State House - This is our nation's oldest state capitol building in continuous legislative use. It is the site of George Washington’s resignation from his commission as commander-in-chief of the Continental Army. Tiffany skylights adorn the current House and Senate chambers. 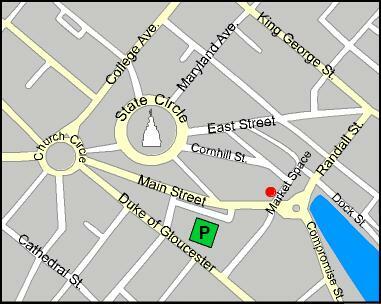 Tours start at the Hard Bean Coffee & BookSellers at 36 Market Space (across from the City Dock and near the bottom of Main Street, red dot on Map above).